Bone broth is one of the newer foodie trends these days, but it used to be the way broth was just made — the days before you bought some dried bouillon cubes or packaged stock in the store. Back then, the stock pot was always simmering on the back of the stove with its rich collection of scraps, both animal and vegetable. When you simmer bones for many hours — and we’re talking 24 hours in the case of beef and chicken bones —what you get at the end is something that deeply nourishes both body and soul. 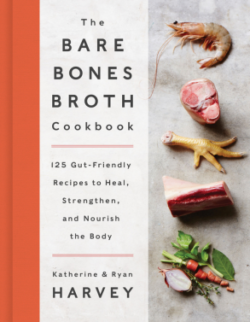 And it’s not just for soup, as Katherine Harvey shows in the book she co-wrote with her husband Ryan Harvey, The Bare Bones Broth Cookbook: 125 Gut-Friendly Recipes to Heal, Strengthen, and Nourish the Body. The book includes delicious recipes for main dishes and sides, like chicken pot pie and carrot souffle, as well as soup — and more. The Harveys say bone broth is great for our health, too, boosting immunity, aiding digestion, strengthening bones and giving us better looking skin, hair and nails. And it could help us recover faster from injuries. Ryan and Katherine Harvey are the founders of the Bare Bones Broth Company which sells bone artisanal bone broth to consumers. The feast in question was held in honor of the Winter Solstice at the home of my good friends Michel and his wife, who I call Magali in this story. They live in the ancient Roman town of Apt, in a villa with a view of the town and the Luberon mountain range above it. The food was divine, the wine likewise, and the company convivial — and I ended up learning a profound lesson about the French Art of Living. 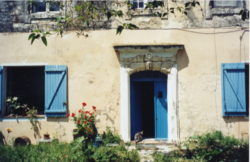 I wrote up my experience in the story, The Food Philosophe, part of a longer memoir of my sojourn in Provence. I read a long excerpt from the story here, joined at the end by former Writers Voice co-host, Daisy Mathias, who plays the part of Magali. When Thanksgiving rolls around, Native American storyteller and historian Marge Bruchac gets a lot of requests to talk about the first Thanksgiving, when the English settlers got together with the Wampanoag natives of Massachusettsfor a feast. The year was 1621. Bruchac co-authored the book, 1621: A New Look At Thanksgiving. We continue our annual tradition of airing Marge Bruchac’s telling of the true story of Thanksgiving. Bruchac is an anthropologist, historian, and museum consultant. She’s also a performer of Algonkian Indian music and oral traditions. In addition to 1621, she’s the author of other books, including the children’s book, Malian’s Song. We also hear her song, Mothers from her album, Voices in the Woods. We’re starting a new Web-only series, called What You Need To Know. At the dawn of the Trump era, we feel it’s important to counteract all the fake news and propaganda that helped lead us to this moment and that seems to be gaining ascendancy in the national discourse. Pingback: Tara Whitsitt, Fermentation on Wheels & Katherine Harvey, The Bare Bones Broth Cookbook.